First Line: Leaves, mud, and grass deaden sound. Young Detective Constable Lacey Flint has finished interviewing a witness at a London apartment complex when she stumbles into a woman brutally stabbed just seconds before in the complex's dark parking lot. Within twenty-four hours a freelance journalist receives an anonymous letter pointing out the similarities between this stabbing and Jack the Ripper's first murder-- and this letter mentions Lacey by name. If this is real, London has a killer determined to recreate the city's bloody past-- and the police have just five days until the next attempt. Although the letter writer seems to be taunting Lacey, no one-- even her-- believes the connections are anything but a sadistic killer's game. However, as they begin to investigate deeper into the details of the case, Lacey is reminded more and more of a part of her past that she'd rather keep hidden. The only way to do that is to catch the killer herself. 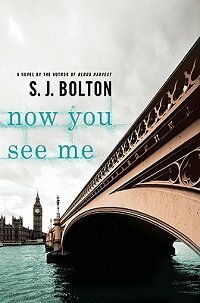 Just when you think Jack the Ripper has been done to death, along comes a talented writer who proves to you that there's still life in the old geezer. What keeps this from being a tired rehash of the Ripper murders is twofold: (1) It's not a slavish copy of the original Jack the Ripper case. The killer is using the bits and pieces that fulfill the purpose, and discarding the rest. It's up to the readers and the police to figure out what the purpose is. (2) Taunting young DC Lacey Flint puts the focus on her and what a serial killer may want from her. As the focus sharpens, it's learned that Lacey has something big in her past that she wants no one else to know-- and her reliability as a narrator is put into question. This book moves quickly and really gave me a workout as I tried to figure out the point the killer was trying to make... and what Lacey was trying to hide from everyone. Bolton lets us get to know Lacey and to trust her before putting her reliability in doubt. As the end of the book gets ever nearer, it's easy to feel that you've put all the pieces together and solved all the mysteries. Don't be too cocksure of yourself, though. I would imagine that Bolton has more than one surprise in store for you. Don't you just love a book whose plot twists and turns, twists and turns, twists and turns... then suddenly stops, faces you, gives you a nice juicy raspberry, and proceeds to twist a few more times before coming to a halt, out of breath and laughing? I do! Cathy - Thanks for this review. Bolton has written some fine books (Have you read Awakening? )and this one sounds like a very good read. Your last paragraph has me in stitches. You are so funny, Cathy. I've seen another good review of this book and now your A+ has completely sold me. It sounds like a great thriller..great review! I like the Ripper addition to it, that peaks my interest. Margot-- I have Awakening sitting on my TBR shelves. I've heard nothing but good about it. Barbara-- Great! I hope you enjoy it. Kay-- Don't tell anyone, but I'm a sucker for ole Jack, too! Kris-- Funny how Jack is still a stud after all these years, isn't it?